I have been working on getting the word out about a fundraiser for Japan I am doing. 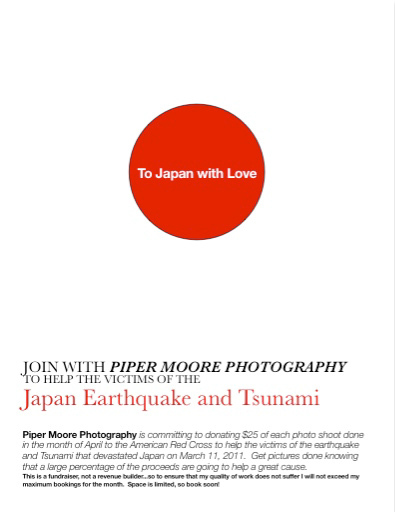 I am donating $25 of each photo shoot done in the month of April to the relief efforts in Japan. I am excited about this and together with my clients have already raised $75! If you know anyone in the Seattle/Tacoma area that wants some pictures please tell them about this awesome way to get their pictures done while knowing they are helping out the wonderful people in Japan. Here is a flyer I made up for a local consignment shop that is going to start carrying my business cards and allowing me to hang some of my photos (I will do a little plug for that awesome place later).